Sony PlayStation 3 or PS3 is Sony’s seventh generation or era of video game console, and the third of the PlayStation gaming console series, which succeed PlayStation and PlayStation 2 video gaming console. The much anticipated PS3, which finally is launched and sold on stores’ shelves, competes with Microsoft XBox 360, which has a year lead, and Nintendo Wii which will be launched in December. 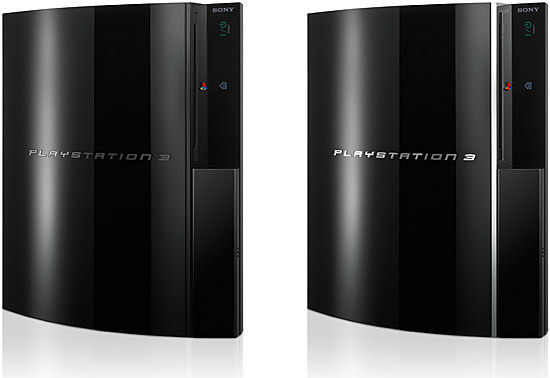 The PS3 is powered by 3.2 GHz Cell Broadband Engine processor which incorporates PowerPC-based “Power Processing Element” (PPE) and various 3.2 GHz Synergistic Processing Elements (SPEs) and other elements or units connected via an Element Interconnect Bus, and comes with 256 MiB of Rambus XDR DRAM clocked at CPU die speed, and RSX graphic processing unit (GPU) running at 550 MHz with 256 MiB GDDR3 VRAM clocked at 550 MHz. PlayStation 3 features support for standard and0 HDTV (full HD at 2 channels) resolutions (up to 1080p60), HDMI 1.3 and component video connectivity options, supports 7.1 digital audio, Dolby TrueHD, Dolby 5.1ch, DTS, LPCM and other audio format, comes with Blu-ray Disc drive which supports wide variety of DVD and CD formats, 20 GB / 60 GB 2.5″ SATA150 hard disk pre-installed with Linux, and has network connectivity options via USB 2.0, Bluetooth 2.0 (EDR), Wireless Controller Bluetooth, and gigabit Ethernet port, plus IEEE 802.11 b/g Wi-Fi at 60GB premium PS3 configuration, which also include Memory Stick, CompactFlash or SD/MMC flash memory slot. PS3 is also a music player, movie player, picture viewer and Internet browser. The PlayStation 3 weighs about 5 kg and measures 9.8 cm × 32.5 cm × 27.4 cm. PS3 also has PS3 SIXAXIS wireless controller that is nearly identical to that of the predecessor’s DualShock, with features such as finer analogue sensitivity, more trigger-like R2 and L2 buttons, a PS button, and a USB mini-B port for charging the internal battery and use for wired play. Digit has a first look on the Sony PlayStation 3 demo console and concludes that ‘physically, it’s a monster of a machine. At 5 kilograms the console is pretty heavy, perhaps heavier than you’d imagine when you see it. It’s also very, very shiny: it collects fingerprints like crazy, perhaps even beating the iPod’s ability to do so. Make sure you add a soft cloth to your launch day shopping list otherwise you’ll be smudging and scratching it up in no time. The gaming, network functions and Blu-ray Disc player all add up to living room fun but only if you’re got an HDTV. Consumers with standard definition sets might do well to sit tight until they have a TV that does the PS3’s picture quality justice, because there just doesn’t seem to be enough to justify the hefty price tag if you won’t be getting the full effect of the graphics. The Seattle Times said that PS3 is nifty but it’s a bit too pricey with comment that it might be worthwhile if the PS3 were the greatest device ever for the living room. But its controls are a little quirky for people who aren’t PlayStation fans, and it’s not clear whether the PS3 will be as good for downloading movies and TV shows as the Xbox and Apple’s upcoming set-top box. Those limitations, combined with the high price, could scare away most of the mainstream consumers building out their high-definition TV setups. USA Today compares Sony PlayStation 3 and Nintendo Wii, and concludes that for PS3, to get the most out of this sleek black machine’s horsepower, you’ll need a HDMI audio-video cable (not included) to connect the PS3 to your HDTV, while the Wii is the best pick for younger gamers. Players will be able to download hundreds of Nintendo classics such as Super Mario Bros. for a few bucks each, or players can watch free streaming online content via Wii Channels.